Q. Backcountry Dad, huh? So, what's the deal? A. We're on a mission to get kids connecting with their dads by way of seeing the Great Outdoors. If you've ever read the book The Last Child in the Woods by Richard Louv, Mr. Louv postulates that "nature-deficit disorder" is a condition at a level that would make it belong in the DSM-5, the Diagnostic and Statistical Manual of Mental Disorders that doctors use to diagnose psychological problems. Now, Mr. Louv has written a great book- if you have the chance to read it, I'd highly recommend it, as I believe it speaks to a very real problem in our society- but I think he misses the point a bit. I'm not sure that you can lay that "nature-deficit disorder" at the feet of our children. Because it's not their fault they aren't interacting with nature. It's ours. We, as adults, as dads, are the ones with nature deficit disorder. We're the ones failing our kids, not the other way around. I don't know about you guys, but- and not to sound curmudgeonly or cantankerous- when I was a kid, in the summer I'd be kicked outside and told not to come back until it was dark. I'd run all over the countryside with my dog, getting dirty, exploring everything I could. At night, we'd go outside and look up at the night sky and see the stars laid out above us, the white band of the Milky Way. Q. How'd you come up with this idea? A. I'd like to say it came to me in a brilliant flash of inspiration, a veritable light bulb above the head- but it didn't. There's no fancy story. It's been a process years in the making, until it finally came to a head recently. A few things contributed to that. My daughter turned seven; I turned thirty; and, most importantly, I realized how much I'd failed her. She can swim laps for an hour, but can't fully ride a bike. She knows the names of the constellations, but has never seen the night sky away from the city lights. She can explain photosynthesis to me, but has barely experienced any more nature than you find in a postage-stamp sized communal grassy area in an apartment complex. People tell me that you haven't failed your kids if you've been there for them, and, despite a number of challenges, I have been there for her. I know that she could be much worse off; I've worked in Pediatric Acute and Intensive care settings, in school systems, in emergency departments, and I've seen the life some kids lead, what they have to go through. But there's no doubt in my mind that if my daughter's suffering from "nature deficit disorder", then I'm the cause of it. And I want to fix that- but I want to help enable dads everywhere to be able to do the same. Q. Very emotional, but how do you plan to get that done? - Give a brief rundown on what's there for dads and their kids. - How to plan a trip there, with an eye to hitting the backcountry and seeing things that are normally off the beaten path. - Giving a detailed explanation on how any dad can get that done, regardless of their past outdoors experience, fiscal or time limitations, distance needed to travel, et cetera. - And finally, in the process of doing that, help enable these dads connect with their kids in a meaningful way. Q. None of that information is out there already? A. No; a lot of it is. But that's part of the problem. Let's say you want to take your kids to Glacier National Park. It's a beautiful place, the "Crown of the Continent," and some of the best backcountry camping and hiking to be had in the world, hands down. They say the Glaciers that give the park it's name are receding, and might be gone entirely by 2030. 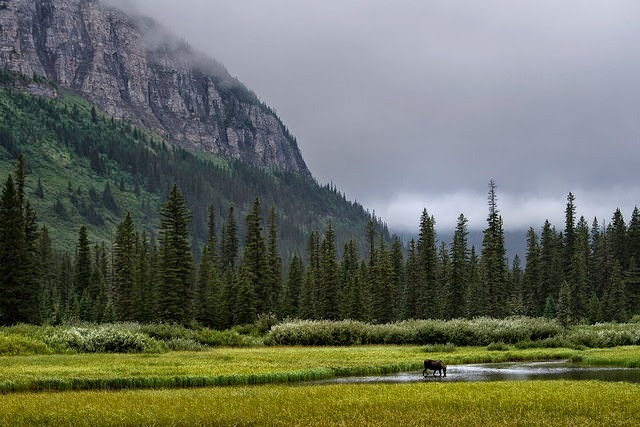 You want to spend a few days there hiking, fishing, camping, and spending time with your kids, showing them a million acres of pristine wilderness, of ten-thousand foot peaks that mark the backbone of the country, the Continental Divide. But that means getting to northwest Montana; knowing when to go, how to get there. What to pack, and what to buy once you get there. If you're going backcountry camping or hiking, you'll probably need a permit, which can be a byzantine process in and of itself. Where to go once you get there; there's hundreds of miles of trails, which is great, but which ones are the right ones for you and your kids? And if you're like most folks, the amount of outdoor equipment you have is probably negligible as well. You've got a thirty-dollar tent from Wal-Mart, and the only sleeping bags you have feature princesses or ninja turtles. You've got one pair of sneakers you wear pretty much every day, and a backpack that's been stuffed in your closet since high school. When you start to add all the logistical challenges together, tallying price tags, your eyes can start to glaze over. For instance, you know you'll probably need a new tent, but the websites you visit, the reviews you read, talk about multi-hundred dollar tents tested at one of the Base Camps on Mt. Everest. It's like reading a review of a Bugatti Veyron instead of a Toyota Corolla; cool, but it has no bearing on you, what you need, or what's feasible. So it's easy to just simply give up. I had friend who grew up in the Midwest; his dad talked for years about taking him to see Big Bend National Park in southwest Texas, as something he'd wanted to do his entire life. But his dad kept hitting the same stumbling blocks described above- going hundreds, if not thousands, of miles from home, not knowing what to buy, where to go once there. And as a result, they never went- and now can't go. We want to break that vicious cycle. We want to make a repository of knowledge for these dads and their kids. We want to show them it doesn't have to break the bank, it doesn't have to take a month, it doesn't matter how much experience you have going in- you can do it with your kids. We want to show you the best way to get there. We want to test and review the $75 tent that is the right one for you for that trip to Glacier. Or the $50 backpack that'll work just fine, just as well for what you want to do as the $300 one you saw on your favorite outdoors blog. Or the trail to take, and the permit to get, for the perfect overnight hike for you and your kids, challenging enough to make it worthwhile but not backbreaking. What to cook (and how to cook it) when you get set up for the night. Q. Isn't part of the adventure figuring this stuff out on your own? A. Absolutely, and we don't want to take away from that. We want to get folks started; we want to show that any dad can do this, and how to do it for the first or second time. We're the training wheels, and once we get folks set up, we want to watch them kick those training wheels off and soar on their own. It's always been my opinion that the highest level of success one can attain is training someone to be better at something than you are. Getting these folks up and running, and then watching them exceed all expectations. And that's exactly what we hope to see here. Q. So, you think forcing your kids out into the woods is going to fix all your custody/divorce/parenting/interaction/etc problems in one fell swoop? "We have a nature deficit among kids in this country... but kids will be excited by nature, if we only let them see it and touch it and be in it." And anyone who's been a parent knows the innate ability for passive-aggressiveness, stubbornness, and general heel-digging-ness kids seem to be born with. So no- a ten-mile forced hike into the wilderness isn't going to magically make your kids love you more, or make you into a better parent, and it's surely not going to happen overnight no matter what you do. This has to be just one part of a process, a lifetime commitment to yourself and your kids, that extends beyond this. We want to be the gateway to enabling dads to be able to successfully get their kids to "see it and touch it and be in it". It's not magic. It's not a magic thing, there's no "get rich quick" scheme here. This is just helping folks take those first few steps, showing them how, and that they can do it, that there's no need to be intimidated. A. Heh, moms too! We want to make our guide work well for ANY parent!